In my early years working, a company I worked for, had a system whereby they matched every share you bought with a bonus share. It felt like free money. When I first started, I bought shares on recommendations by analysts. When the prices of shares in the recommendations promptly went the opposite direction of the recommendations, I learnt to be more interested in the details of this particular enterprise (buying and selling of shares). I see myself as inclined similarly towards both FA and TA and as a ‘buy and hold’er: I buy and hold different things for different periods at different times. In terms of buying and selling transactions, they are more discretionary leaning towards systematic. My body of work in technical analysis is well represented when you follow me on InvestingNote. As cliché as it may sound, the best investment is in yourself. And it happens to be right. The worst investments are every moment we slack off in matters of importance and ‘pinch pennies’ in matters of little consequences. Ergo, we may be making the worst investments daily. The most valuable ‘cost’ in investment terms is time. Time and effort. There are quite a few millionaires. There are no immortals. That tells you everything you need to know about the value of time vs money. When we put in the time to build the foundations to save our future time, that is the single best investment anyone can make. Someone once asked me on InvestingNote – How to be more efficient in investing when we are juggling with multiple commitments? I believe when the foundation is done right, the efficiency flows from there. This is the same thing throughout life. We mastered walking and suddenly, walking is effortless. We mastered addition of numbers 1 to 10, suddenly we stopped using fingers. We mastered dribbling, suddenly we don’t look down while taking the ball across the football field. We mastered work, suddenly we don’t have to check references whenever we need to answer a work query. I don’t believe in idols. All working knowledge work until they stop working. I think Star Wars nailed it when they made the movies alternate between Empires and Republics. As we looked into the histories of Man, be it nation building or fashion or technologies, it has often appeared cyclical especially when we stand far away enough. So simply, it is a matter of picking the ones who are working better right now. And for me, they are all the greats like Buffett, Paul Tudor Jones, Soros and more. I’ve condensed my lessons from them into a controversial and provocative comment over here. Sure I do, I have derived them from lessons I learnt from a variety of sources listed here. but primarily, we want to pick stocks that can make money for us, instead of stocks that make money for others. I have DBS and two other positions in my SG portfolio. I think the market conditions are fantastic this month for those looking to make money. If you haven’t made money in the SG market this year, then the SG market may or may not be for you. Communications, industrials, tech, financials, consumer discretionary in the US market. What is your day to day strategy towards investing or trading? Do you implement a top-down or bottom-up approach for stock picking? I just try to take up positions that make money. Top-down or bottom-up as necessary according to situation. If you are a research reader, you realize there are those whose research showed top-down returns better and there are those whose research showed bottom-up returns as better. who do you believe? I believe the ones who makes money. I take up positions actively and watch the positions and watchlist passively. Meaning I am active only when I take up positions and passively execute my plans as the scenarios unfold. It would be to start my journey the moment I have my first $1000 and keep injecting any idle cashflow to the accounts. One of the most common mistakes across all market participants is being confused about injections and allocations. – Be a ‘buy and hold’er – stay in the market for extended periods of time. This interview was conducted on 23rd September 2018. 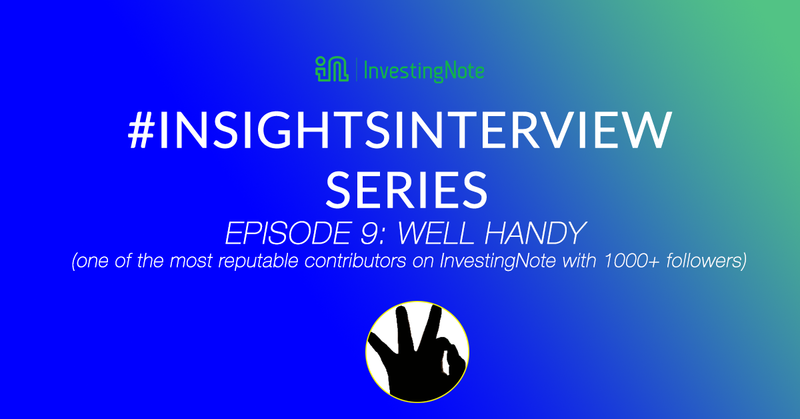 Well Handy currently has more than 1,000 followers and provide many accurate stock estimates. Follow him to get the latest updates and educational posts on the Singapore stock market.